Video games are a form of escapism. We can go anywhere, be anyone and do anything. The execution, but not the idea, of this has changed over the years, as games overload us with cinematic action and scripted events to scream “HEY, DID YOU KNOW YOU’RE ON AN ADVENTURE?! ISN’T IT F$$$$$G AWESOME?! THAT CONTINENT JUST EXPLODED! LOOKATITLOOKATIT!” in our faces. Because of this, what made the 1-2-punch of Halo 2‘s “Delta Halo” and “Regret” levels great was the way in which the developers didn’t do this – it was as much a mystery as it was a thrill ride. In Combat Evolved, the first Halo, the titular Halo rings were a mystery – alien even in a world where humanity was fighting for its life against a religiously fanatical race of tyrannical alien races. 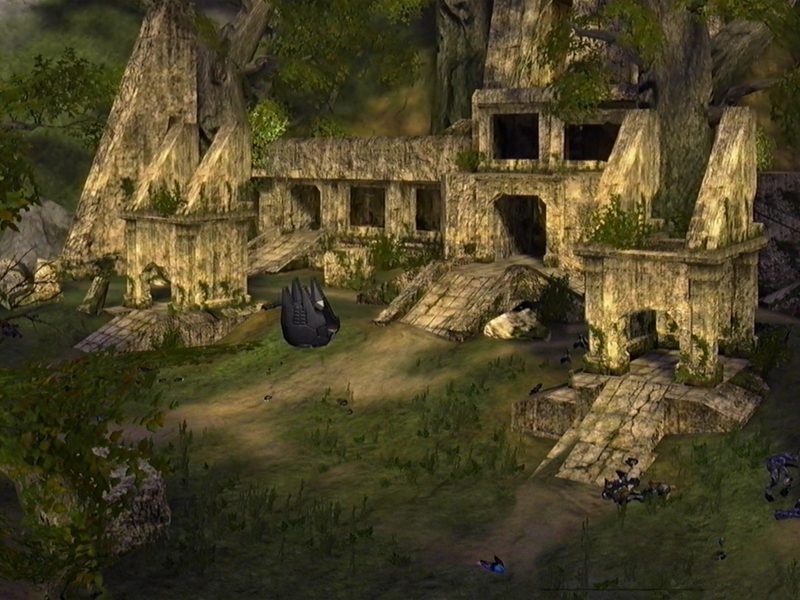 However, in Halo 2, these rings are no longer the mystery they once were, we know why this is here. However, what we don’t know as Chief leaps out of his drop pod in the level’s opening is what challenges we will face and this music portrays that feeling perfectly with the upbeat strings and trotting rhythms. Our weapons are drawn, our heads are up and we are setting out on a new adventure. “Delta Halo” also excels at the art of suggestion. Covenant pour out of a mysterious ruin as you work your way up the slopes of the lake you land by. Cresting the first hill, you see a monolithic temple standing alone in the middle of a lake, hinting at what is to come. Looking to your right, you see another ruin across a bridge. As the bridge draws up, it averts your eyes to what is invariably an ancient control room for this crossing. Not long after you enter these labyrinthine ruins, you come upon yet another lone structure that you must steadily work your way into as Covenant pour out. The level is paced and designed to fill you with child-like wonder whilst pondering at the mysteries this ring world contains – even in the midst of an extra-terrestrial bloodbath. Finally, you are here, the lake that you laid eyes on not long ago. The temple stands in the distance, across a vast expanse of water whose depths are unknown. What happens next is the most baffling thing ever: an incredibly fun and entertaining gondola ride. Moving steadily across this lake, you are besieged on all sides by Covenant buggers and Banshees. Gondolas coming in the opposing direction allow for Jet-Pack Elites to board your craft and engage you. Once again, the building excitement is exhilarating. Climaxing with an underwater elevator ride and a great boss battle with the Prophet Regret in the main throne room of the temple, Halo 2’s “Delta Halo” and “Regret” is undeniably one of the greatest 1-2-punches in the history of level-based games. The art style is great, the pacing is pitch perfect, the music sets an enthusiastically adventurous and mysterious tone all at once, and it ends with some incredible moments. Of the many campaign levels that I have played in the Halo series, these stand out as landmarks as an embodiment of what video games are all about: going on a fantastic adventure to places we could only imagine. What do you think? Are these two levels really that great? Do you think there are some that are just as good, if not better? Let us know in the comments below!